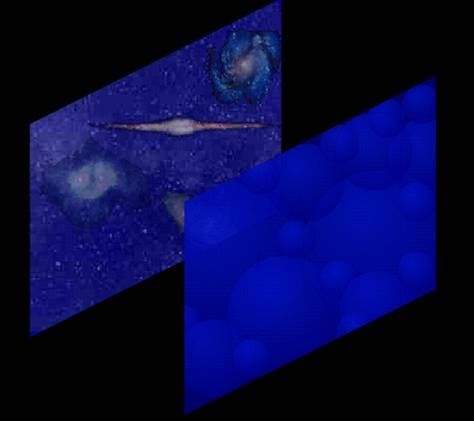 Paul Steinhardt of Princeton University has proposed a "Ekpyrotic Model" of the Universe that describes our current universe as arising from a collision of two three-dimensional worlds (branes) in a space with an extra (fourth) spatial dimension. The proposal is interesting in and of itself, but also because it is the precursor to a more powerful and explanatory theory, the Cyclic Model. The term ekpyrotic derives from“ekpyrosis" meaning “conflagration" in Greek, and refers to an ancient Stoic cosmological model. According to the model, the universe is created in a sudden burst of fire, not unlike the collision between three-dimensional worlds in our model. The current universe evolves from the initial fire. * In the public mind, the Big Bang model means that the universe began from a single point, underwent an explosion, and has been flying apart ever since. However, the big bang is not an explosion at all, rather the big bang is the expansion or stretching of space with all things are moving away from each other.The beginning of the big bang picture was the cosmic singularity, when the universe has nearly infinite density and temperature. There are some skeptics, Steinhardt notes, who have written "the Big Bang never happened", by which they mean that the universe is not expanding today and it never has been. They say this despite overwhelming evidence in favor of expansion and cooling today and for the last 15 billion years. The Ekpyrotic model does amends the earliest moments of the Big Bang story. "Instead of beginning with nearly infinite temperature and density," Steinhardt writes, "the universe began in a very different state – cold and nearly vacuous. The hot expanding universe we know came as a result of collision that brought the universe up to a large but finite temperature and density. The rest of the story is as the Big Bang model would have it, but the beginning is different." The Big bang model, with no amendments, he emphazies, "would tend to produce a universe that is highly inhomogeneous, with a warped and curved space, and no natural mechanism for making stars, galaxies and larger scale structures in the universe. Cosmologists have been trying to correct these deficiencies by amending the early history of the universe – within the first billionth billionth billionths of s second or less. One proposal is the "inflationary theory" of the universe, which proposes that the universe began hot and dense, and underwent a period of hyperexpansion. The ekpyrotic model is a new alternative, which is, in many ways, a more radical departure from the Big Bang concept." Steinhardt's model is based on the idea that "our hot big bang universe was created from the collision of two three-dimensianal worlds moving along a hidden, extra dimension. The two three-dimensional worlds collide and “stick," the kinetic energy in the collision is converted the quarks, electrons, photons, etc., that are confined to move along three dimensions. The resulting temperature is finite, so the hot big bang phase begins without a singularity. The universe is homogeneous because the collision and initiation of the big bang phase occurs nearly simultaneously everywhere. The energetically preferred geometry for the two worlds is flat, so their collision produces a flat big bang universe. According to Einstein's equations, this means that the total energy density of the Universe is equal to the critical density. Massive magnetic monopoles, which are overabundantly produced in the standard big bang theory, are not produced at all in this scenario because the temperature after collision is far too small to produce any of these massive particles. "Quantum effects cause the incoming three-dimensional world to ripple along the extra-dimension prior to collision so that the collision occurs in some places at slightly different times than others. By the time the collision is complete, the rippling leads to small variations in temperature, which seed temperature fluctuations in the microwave background and the formation of galaxies. We have shown that the spectrum of energy density fluctuations is scale-invariant (the same amplitude on all scales). The production of a scale-invariant spectrum from hyperexpansion was one of the great triumphs of inflationary theory, and here we have repeated the feat using completely different physics." But Steinhardt cautions that it is important to realize that inflationary theory is based on quantum field theory, a well-established theoretical framework, and the model has been carefully studied and vetted for twenty years,while his proposal is based on new, unproven ideas in string theory.